I took a trip downtown to McCormick Place and enjoyed Friday at C2E2 – it was a gorgeous visual overload. Here are some of my highlights. 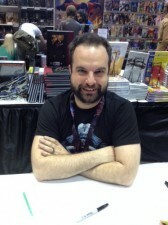 Writer/artist Tim Seeley was signing at the Dark Horse booth and promoting his new comics, Sundowners and Ex Sanguine. Set to come out in June, Sundowners is a horror comic where would-be superheroes meet in a support group run by a corrupt psychologist. A Seeley-style horror/thriller take on the vampire romance, Ex Sanguine is a blood-soaked affair between a vampire and a serial killer that will debut in November. 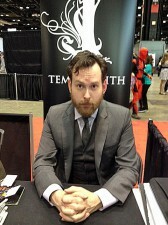 On the publisher’s site, Seeley comments, “Dark Horse has long been the leader in high-quality, innovative horror comics, and I’m honored to bring my blood-soaked ‘romance’ Ex Sanguine to their impressive lineup.” Seeley is busy these days, as he’s also writing Grayson and issues of Batman Eternal for DC and Chaos for Dynamite. As always, Heritage is accepting consignments for its year-round auctions. 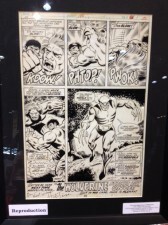 I spoke with managing director of comics Lon Allen about some of their upcoming auctions, and noted that the next major installment of the Thompson Pedigree auction is approaching in May. Some books from the collection go up in Heritage’s weekly auctions as well, and will probably do so through this year. 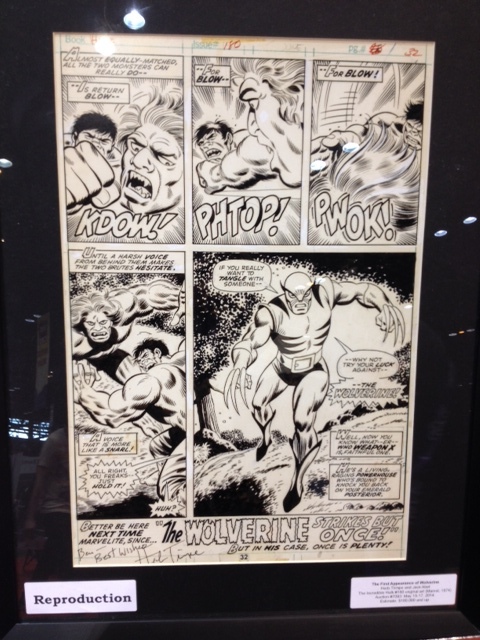 A replica page of the original artwork from Incredible Hulk #180 (1974) attracted a lot of attention from passers-by, who recognized it as the first appearance of Wolverine. The actual page has been in a private collection for the last 30 years and comes up for auction on May 16. The proceeds of this auction will benefit the Hero Initiative. 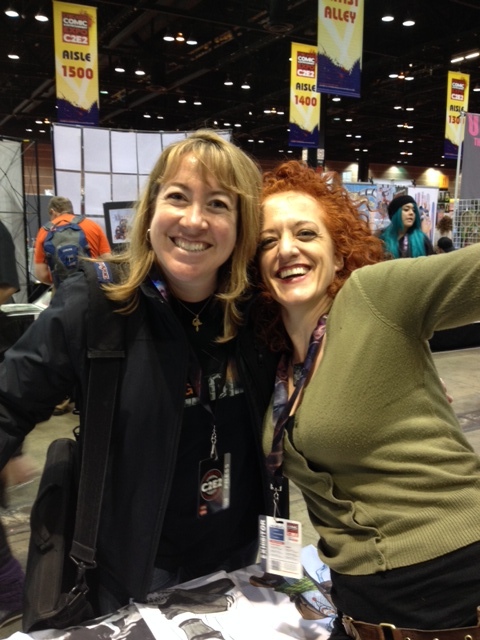 I never pass up the opportunity to see Jill Thompson at a con. She always has time to answer fan questions, sign books, and talk about her work (do yourself a favor and check out her Scary Godmother book). She has another Beasts of Burden project in the works (hooray!) and is working on a top-secret project for DC that hasn’t been announced yet. She did say that it’s a whopping 120 pages, and they’ll announce the project when she is further along with the art. I usually don’t get to attend many panels at a con because I get caught up in the wonders of Artists’ Alley and seldom venture beyond its creative borders. However, I just couldn’t resist heading upstairs to see Patrick Rothfuss’s one-man panel. Rothfuss tells a good story, whether it’s about tutoring writing students during his lengthy college tenure or likening the conundrums of story construction to a dog that can only carry two balls in its mouth while pining for the third. He has two best-selling books to his credit – The Name of the Wind and The Wise Man’s Fear. 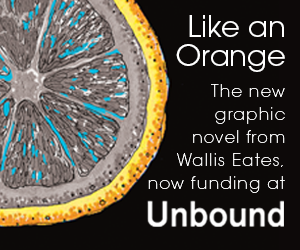 His third book isn’t ready yet, but his fans are a patient bunch and won’t be surprised by that news. While they wait, Rothfuss has contributed a short (by his standards) story to the Rogues anthology and finished a 30,000-word story featuring Auri. Rothfuss also doesn’t like to define his characters by their professions the way we do when we create characters for games of Dungeons & Dragons; rather, he prefers to concentrate on the personal traits of each character he writes. 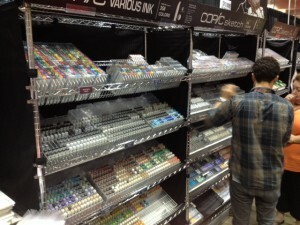 If you don’t know what Copic Markers are, then just skip this story. If the sight of an entire wall of the markers brings you to a complete halt – as it did to me this afternoon – read on. Located within sight of Artists’ Alley, the booth’s placement was no accident. The dizzying array of colors was quite a sight and, according to Copic’s Jackson Root, the booth receives visits from amateurs and pros throughout the con. “We carry replacement inks for the markers, so if an artist is in the middle of a sketch, they can just pick up a replacement from us,” Root said. “We try to anticipate the needs of the artists as well as having a variety of new markers and accessories for them to try here at the con.” Handy color charts are at the booth to illustrate the exact color a given marker will produce. My first introduction to Ben Templesmith’s art was his stunning cover work for Oni Press’ Wasteland. 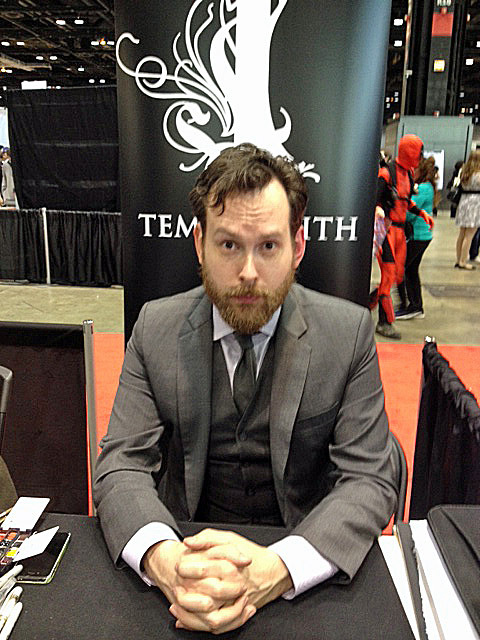 He’s currently working on an original graphic novel that he wrote and illustrated, The Squidder – both the successful Kickstarter version that will be out in May-June and the version to be released by IDW in July. It’s about an “old soldier from a forgotten war in a post-apocalyptic world that has left him behind.” It promises to have elements of horror, fantasy, and dark humor in a world of propaganda and constant change. When you turn a corner and almost run into Stan Lee, who had just been perusing a booth specializing in vintage comics, you say “Hi” and get out of the man’s way. Which is exactly what I did. He had several Marvel staffers with him and they were guiding him back in the direction of the company’s booth, so – like a dozen other people – I followed along. 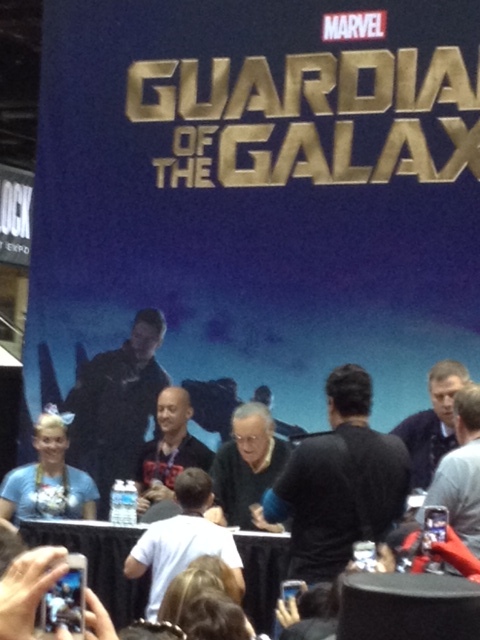 It’s amazing to watch heads turn when Stan walks the floor of a con; some notice and don’t know who they’re looking at, but the rest are all fumbling to get their phones and cameras out and snap a picture. After all, when is Stan Lee ever going to be that close to you again? The scene was no different when he arrived – to applause – at the Marvel booth; there was a sea of phones held high in the air to get a shot of Stan. I should have taken a video of the crowd, as more people gathered around while the people in line produced all manner of items for him to sign and the sea of phones and cameras moved in waves like a mini ocean. Well, that’s it for my Friday observations, I have quite a list of people to talk to tomorrow. Hope to see you on the con floor! Sounds like a fun con. Awesome pic of you and Jill!